No matter where you live in the country, rain can happen on race day. As this post goes live just a few days before the 2018 Boston Marathon, the forecast predicts cold rains on Marathon Monday. And in Seattle? Well, we have races that are called “Rain Run Half Marathon” for a reason. Racing in the race is not the ideal, but it certainly is reality. Inclement weather does not have to result in having a bad race. 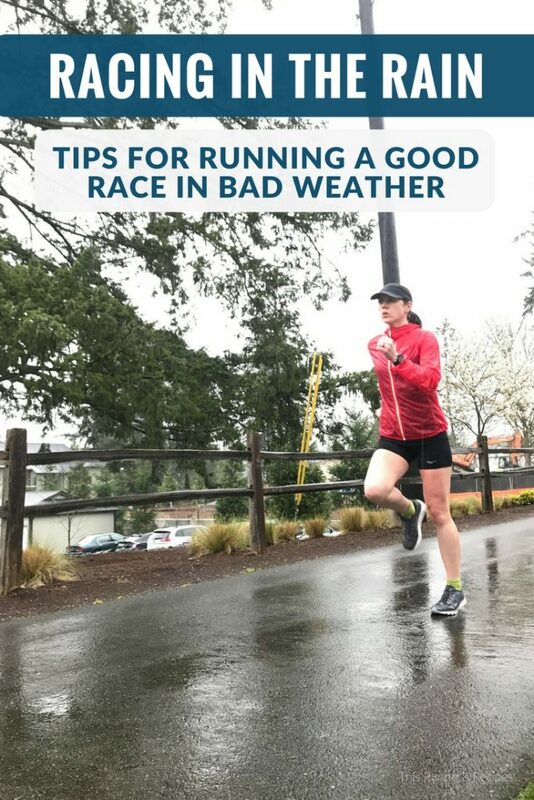 With the right gear, adjustments, and mindset, you can still run a strong race with these tips for racing in the rain. Unless the weather is truly dangerous, opt outside whenever you can. The treadmill may be dry, but you aren’t racing on the treadmill. By training in rainy conditions, you will mentally and physically prepare yourself for racing in the rain. 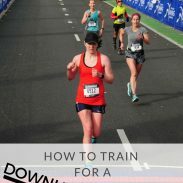 You will learn how to cope with the sensation of being drenched during a long run and how to pace yourself in a downpour. And honestly, running in the rain is never as bad as it seems. Stay as dry as you can for as long as possible, especially at a race like Boston when you have to arrive hours before the start gun. Use a new garbage bag with holes cut in or a poncho to keep yourself dry up until the start of the race. If you are worried about your feet getting wet, tie plastic shopping bags over them. 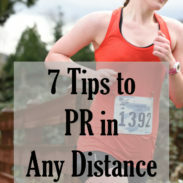 Especially if you sweat a lot, you want to skip the rain jacket on race day. Just because you feel comfortable in running rain jacket at the start line does not mean you will at mile 10 or mile 20. Even rain jackets designed for running do not ventilate heat or wick sweat well – the better a rain jacket protects you from the rain, the less it will ventilate or wick sweat off of your body. Runners who are more sensitive to the cold can opt for a thin water-resistant vest, which provides some warmth and protection but allows for ventilation. It can be tempting to bundle up for a racing in the rain, but you don’t want to overheat. Take into account your own personal temperature: if you tend to overheat easily or sweat a lot during a race, don’t pile on layers due to the rain. You will just end up weighed down by soaked, soggy clothes. Opt for wicking layers that will keep you warm but do not hold in heat. Since hypothermia can be at risk when racing long distances in cold rain, stay warm with layers that you can easily adjust: arm sleeves, gloves, Buffs, a warm pair of wicking socks, and ear warmers. If you do wear a rain jacket, do not fasten your bib to the jacket! Attach it to your shorts/leggings if there is any chance that you will remove a top layer during the race. If you have to stop to remove your rain jacket, you do not lose extra time having to re-pin your bib. 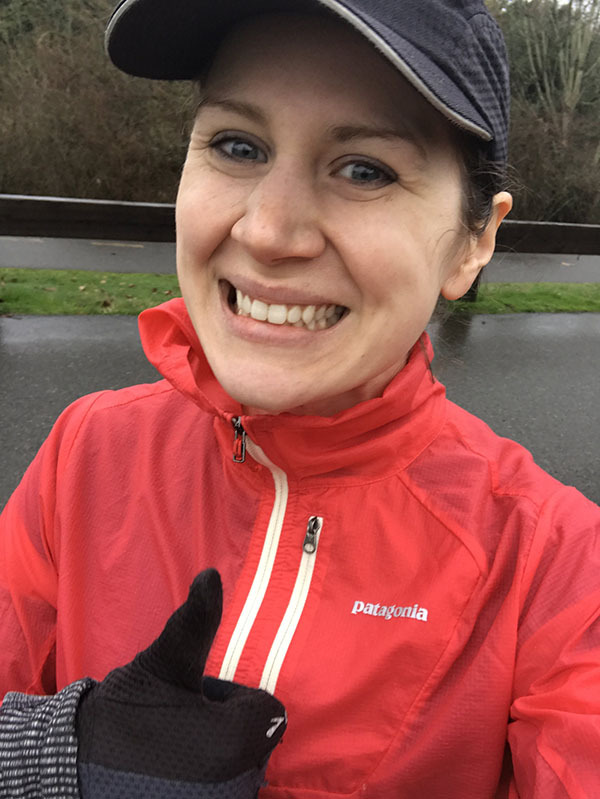 Alternatively, if you want a rain jacket, you could wear a disposable poncho – it’s not the quality of a running rain jacket, but when you decide to ditch it at mile 8, you aren’t leaving a $100 jacket on the side of the road. If you’ve trained in the rain, you will have a good idea of your ideal race day outfit. Stick with what has served you well in training – do not buy a brand new jacket to wear on race day! Finally, don’t forget the Body Glide or a visored hat! These two are essentials for staying comfortable: the Body Glide (or Aquaphor, Vaseline, etc) will prevent chafing and blistering, while the hat will keep the rain off of your face. A dry face makes all the difference! Racing in cold temperatures burns more carbohydrates than racing in ideal conditions – and this especially true for racing in the rain. Eating slightly more before and during the race will compensate for the increased carbohydrate use and keep you cognitively alert in mentally demanding conditions. Don’t stuff yourself, but try adding slightly more to your pre-run meal (such as adding honey or jam to your bagel and peanut butter) and fueling slightly more frequently during the race (such as every 35-40 minutes instead of 45 minutes). You can easily lose dexterity in a cold rain, which can make opening sports nutrition products tricky during the race. Use a fuel flask (such as this one) for your gels, since it is easier to open with numb hands than a gel packet is. If you use whole foods or chews, place them in a Ziploc so you aren’t dealing with any wrappers during the race (this will also keep your food dry). Leave the Ziploc unsealed to easily reach for your fuel mid-race. Out of everything, this is the most important. You can wear the most water-resistant gear, but if your mind has succumbed to defeat, you will not have a good race. The weather is like the discomfort of racing: if you focus on the negative and convince yourself you can’t overcome it, then you will have a tough race. But if you embrace it and refuse to give up, you can have a strong race day no matter the conditions. Shift Your Attention: You can’t ignore the rain, so acknowledge it, remind yourself that you are stronger than it, and shift your focus to anything else: the race itself, runners around you, engaging with the spectators. Focus on What You Can Control: You cannot control the weather, no matter how much you obsess about it. Obsessing over the weather only creates unnecessary stress and wastes mental energy. Instead, focus on what you can control – your effort, your mindset, your nutrition/hydration, what you wear, etc. Remember Your Strength: At the start line, recall a training run where you ran well in tough conditions and draw confidence from this run. Reiterate to yourself that you are stronger than the weather. Smile: Even if you have to force it, a smile reduces your perceived effort and improves your mood. When your mind drifts to a negative place or the intensity of the rain increases from a drizzle to a downpour, smile. Smile at the spectators, volunteers, and other runners. Chances are, you will feel better throughout the race – and possibly even run faster despite the conditions. As soon as you cross the finish line, you want to get out of the wet clothes. Now that you are done running, your body temperature will drop and staying in wet, cold clothes will increase your risk of hypothermia. If there is any chance of rain during the race, pack your gear-check bag accordingly with a towel, and dry clothes including sweatshirt or another warm layer. Try to eat or drink something warm as soon as possible: hot soup, a hot cup of tea, etc. Warm food and drink are comforting and will help you warm back up! Have you ever raced in the rain? How did you manage the conditions? What’s the worst weather you’ve ever raced in? 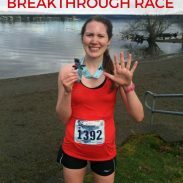 Every single marathon I’ve run has been in the rain. Gah. I don’t mind a little rain but a cold downpour is no fun. I laugh at people who say running in the rain is their favorite. Clearly they have not spent hours and hours running in it! But like you said, mindset is the best way to get over it. You’re going to be soaked from head to toe so make do and run! I would hope no one enjoys running for 3 or 4 hours straight in the rain! I hope if you do run a marathon again, you have clear weather! These are great tips! I remember running the Houston marathon in the pouring rain and cold. We had already traveled there when the forecast changed to rain so I had limited race day outfit options. I ended up with quite a bit of chafing and I don’t think Ive ever been as cold as I was walking back to the hotel after the race! The time standing in the cold rain after a race is even worse than the race itself! A strong mental game in the rain does give an edge over the competition! Thank you! The layers are the trickiest part! I’ve lucked out and I haven’t had to run too many races in the rain…and the ones that were wet, it didn’t rain the whole time. But, if I ever have to race in the rain (especially a longer race), I’m definitely coming back to these tips! Thanks, Laura! That is lucky! Hopefully you never do have a race completely in the rain! I agree – not quite hitting your A goal doesn’t have to make for a crap race! And I would much rather have rain at Boston than heat… for the exact reason you said, that training out here would built up resistance to it! I’m a HUGE believer in getting some runs out in the rain. You definitely never know what race day will bring so it’s good to be prepared! I agree! Plus, running in the rain beats being stuck on the treadmill! Yes to the brimmed hat! I also recommend gals with long hair opt for braids instead of a pony tail (much less of a rat’s nest to untangle afterwards). I once ran a 5-miler with a drycleaning bag…it weighed nothing, my bib showed through, and I cut slits along the sides so I could access my phone, etc. (and the slits also gave me a little ventilation). Yes to braids! That’s smart to use the dry cleaning bag as a makeshift poncho! I always wear loose shorts for rainy races (if it’s raining then it’s also above freezing….) They’re generally made from lighter, quicker drying fabrics than capris/leggings – plus your legs aren’t encased in soggy fabric if you get totally soaked. The feeling of soggy shorts is so unpleasant! ugh yeah, last year’s 10k was in total rain! bleh. I don’t enjoy it at all – I can handle a misty rain if it starts while I’m running but I hate going out into the rain if that makes sense. It’s so hard to start a run when it’s already raining! Love this, Laura- and it’s perfect timing, as you know! I need to remember to throw in arm warmers and a visor- and body glide! I’m thinking the rain will be okay- just hoping it’s not too crazy windy! Good luck at Boston on Monday! These are excellent tips! When I ran the Broad Street Run a couple of years ago, it was POURING rain! I never thought I’d be the runner wearing a garbage bag before the race but it really works and makes a huge difference! I think it’s important to embrace the weather no matter what it is! That’s awesome that it made a difference for you in that race! I agree – you can’t control the weather on race day, so might as well take what it gives you! Thanks for the tips. I haven’t raced in the rain yet, but it’s definitely something to plan for. I usually don’t mind rain, but I imagine it to be tricky when it is also cold.